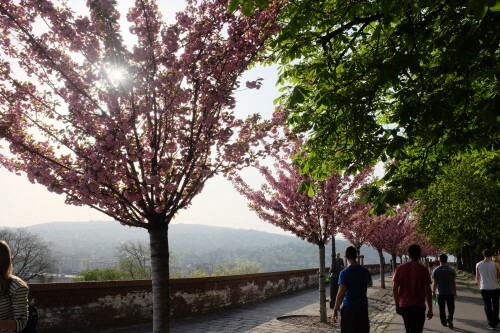 Spring time in Budapest is incredible. Budapest has a walk-a-bility of 10/10. It’s really one of the best European cities to walk and eat your way through. Here are a few of my favorite street foods in Budapest Hungary, I hope you packed your walking shoes, you will need them. Happy eating! I don’t know about you, but I feel, to truly understand a culture you must taste it! Street food is always my first point of call when I arrive at a new destination. I like to walk, explore and taste it all. Budapest, well actually Hungary as a country, is known for paprika. The rich, red-colored spice that’s made from air-dried chili peppers: aromatic and delicious. Hungary is known for paprika soups and chicken, and for adding this tasty spice into many of their dishes. 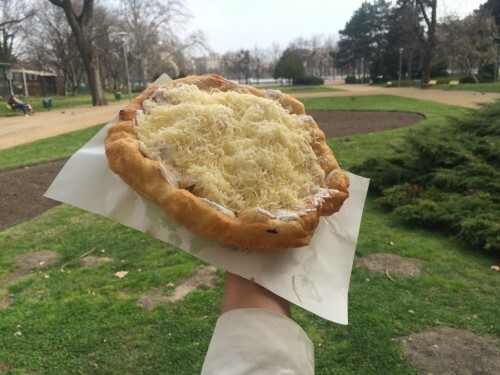 If had to sum-up the food in Hungary in a few words: Cakes: creamy or laden with nuts, Langos (a large donut with cheese and sour cream), sausages and paprika. This briefly sums up my food take on Budapest. If you have a sweet tooth then you will certainly love this city. There are patisseries everywhere you look. You are never short of finding a donut or a cake in this town. 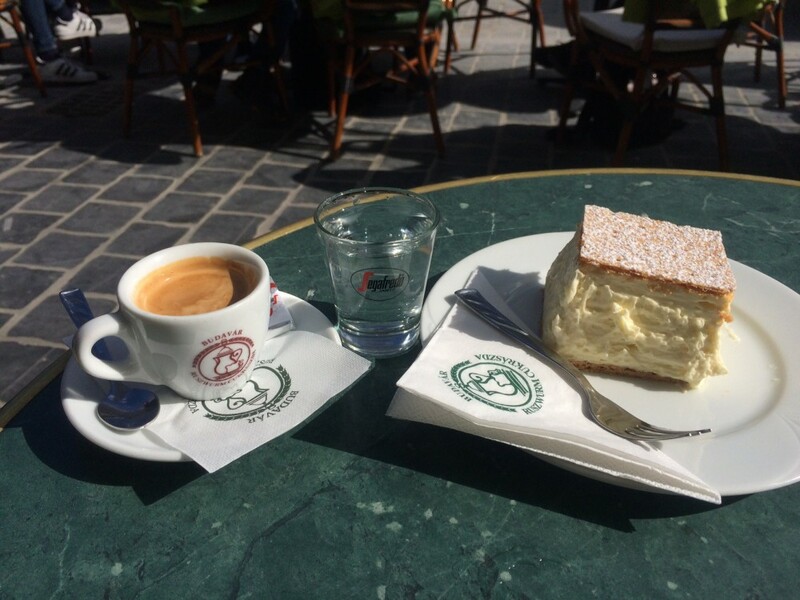 Here are my recommendations for an eating/walking tour through Budapest. Enjoy! Let’s start with cakes and sweets: I found this bakery, Ruszwurm at the Budvar Castle. It serves an array of pastries and coffee. I went for their ‘signature cream cake’ and an espresso. Of course when visiting Budapest you will visit Budvar, and Ruszwurm is a must. You can start here and get your morning caffeine-fix. 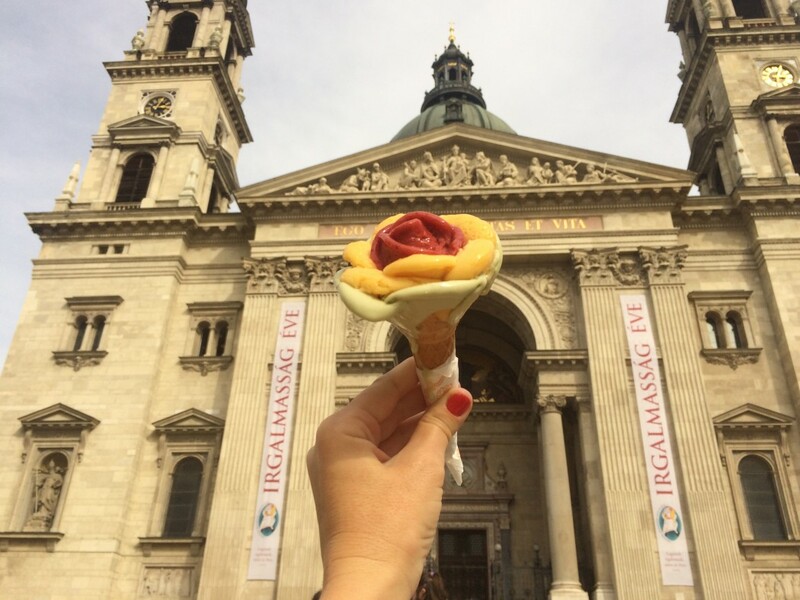 While you build up an appetite walking around Buda Castle and Matthias Church, taking photographs and admiring the view stop off at the little Kürtőskalács stand called Körösfői Kürtőskalács. A Kürtőskalács is a strip of dough that is spun and then wrapped around a truncated cone, its cooked on charcoal and basted in butter and cinnamon and sugar (see pic below). The Kürtőskalács are made fresh to order. Don’t miss this one! It will give you enough energy to continue our walking tour. The Hungarian National Gallery is right near the Castle, you can browse through an exhibition before continuing on. Quick note: The tiniest and most of the time shabbiest places serve the best, freshest food. Tip: if locals are there lining up that’s where you need to be! This eating/walking tour is on the ‘tourist-trail’ however I do suggest to get off the path and find your own little places from time to time! Walk and get lost- this is when you find the best cuisine. Try to avoid the set menus with English in tourist areas, I feel like these are mass-prepared meals and often tasteless garbage! Like I said, get off the-beaten-track and find tiny hole-in-wall type places where locals eat. The next stop after Kürtőskalács and Buda Castle is just hop, skip and a jump over Lanchid Bridge to St Stephen’s Basilica and Gelato Rosa. 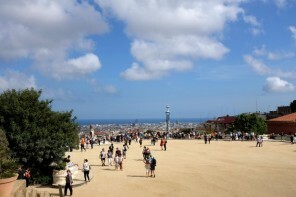 The square itself is beautiful, a large open-space with the Basilica standing proud right at the end. Gelato Rosa is right next to the Basilica on the right-hand side. You wont miss it (there is always a super-long que outside). They hand sculpt every ice-cream into the shape of a rose. Worth every minute of waiting, plus the gelato is some of the best gelato I’ve had in my life. Inventive flavors to choose from and very authentic. 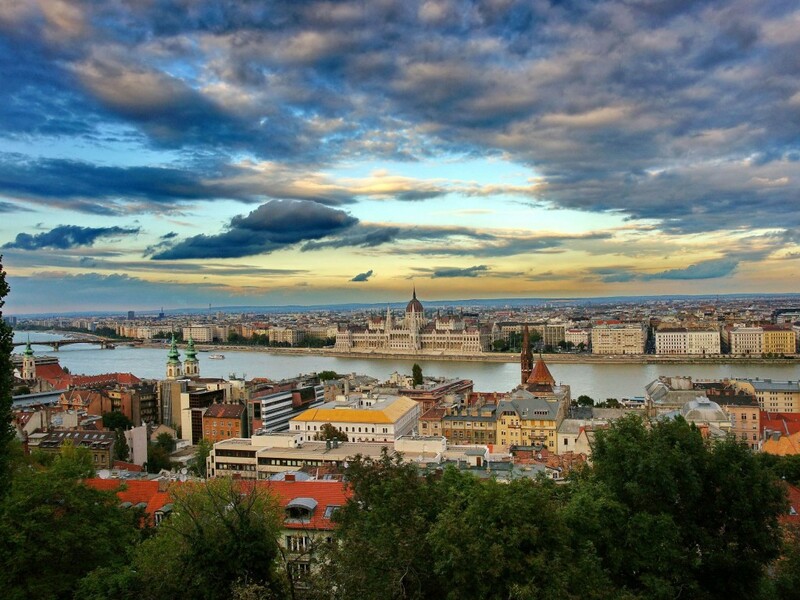 Budapest is the ideal ‘walking city’ in Spring and there is a lot to see and a lot of tasty delicacies to try. Part 2 of Street Food Budapest will cater more for those with a savory palette, we will visit Margaret Island and the Central Market Hall to sample more Hungarian delicacies! I hope you enjoyed this post and you enjoy the walking/eating tour of Street Food Budapest. Please comment below and let me know what else you found along the way. 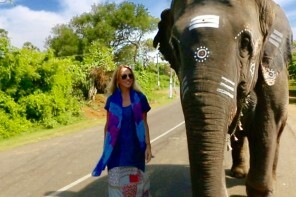 Next articleIndia Diaries 2: The Real India? I love langos! You would think it would be too rich with the cheese and the fact that it is fried, but somehow it manages to work. We also had some great meals in local butcher shops there – spicy sausages for the win! You made me remind of my Budapest trip. It is really one of the beautiful countries I have ever seen.